A few years ago, I was in San Francisco for a work-related conference and my husband and I were looking for some new restaurants to try while we were in town. I love using Trip Advisor and Yelp when I travel to find new restaurants and attractions. On a whim, I thought “Let me see if there are any Cajun restaurants nearby”. Sure enough, we hit the jackpot. We discovered Brenda’s French Soul Food in the Tenderloin. We were staying near Union Square, which isn’t too far away from Brenda’s. After reading the reviews on Yelp about how packed the restaurant usually is for dinner, we decided to go for breakfast the following day. The Tenderloin area can be a bit dicey, so we were careful navigating there. If you do visit the restaurant, just be aware of your surroundings and take a cab or public transit. I don’t recommend walking from Union Square. We arrived and were delighted to see there was no wait for a table. The restaurant was moderately busy – it was a weekday and they were serving breakfast, so we didn’t expect the place to be packed. 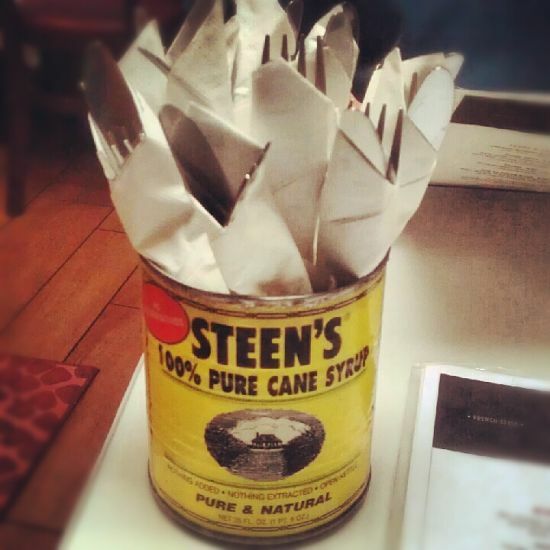 Immediately when we sat down and I saw the Steen’s syrup container on the table that held the silverware, I was taken back home. I was home, in San Francisco. It felt strange, but it was homey and comforting. These were my people – they’d understand me. What a fantastic feeling. We had a delicious breakfast. How can you go wrong at a restaurant with Grits and Grillades on the menu for breakfast? I mean, really. We definitely had to try their stuffed beignets. They had 3 varieties: crawfish, chocolate and one filled with a Granny Smith Apple filling. We ordered a sampler plate with two chocolate and one crawfish stuffed beignet. They were fantastic. Why didn’t anyone ever think of stuffing beignets? Genius, I tell you! 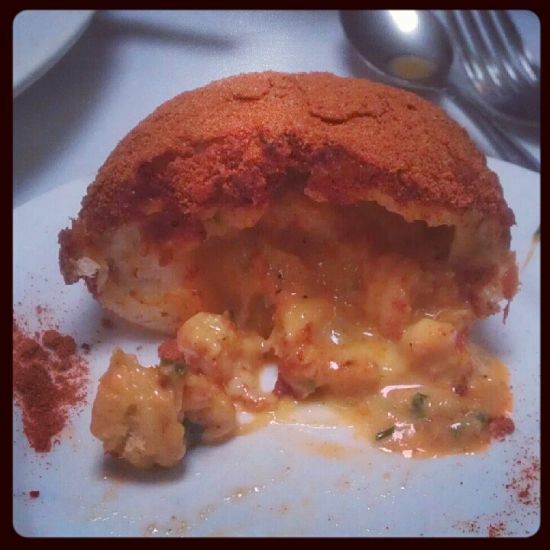 The crawfish stuffed beignet. Yum! I loved Brenda’s so much that we returned a few days later for dinner with a few colleagues who were also at the conference. Again, everyone was impressed with their meals. I’m heading back to San Francisco in September and Brenda’s will definitely be on my “to do” list while I’m in town. What’s the best authentic Cajun restaurant you’ve found in a “foreign city”?